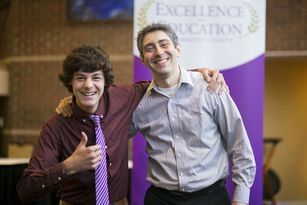 KALAMAZOO, MI — Excellence in Education awarded 46 of Kalamazoo-area’s top-achieving high school seniors with $1,000 scholarships. The seniors will be honored Wednesday, April 17, at Western Michigan University’s Fetzer Center, according to a press release from the Kalamazoo Regional Educational Service Agency. This year, 47 seniors were selected for the honor, each earning a $1,000 scholarship. Among the recipients are six seniors from Kalamazoo Central High School and six seniors from Loy Norrix High School, the release said. Seniors from Portage, Gull Lake, Comstock, Galesburg-Augusta, Parchment, Schoolcraft and Vicksburg high schools are also among those awarded scholarships. The program also awarded eight Educator Incentive Grants, which provide funding for teachers and administrators in Kalamazoo County schools, the release said. The Excellence in Education program is the result of collaboration among all Kalamazoo County public and non-public schools and local foundations, education groups and the business community. The program is supported by a permanent endowment established at the Kalamazoo Community Foundation, the release said.